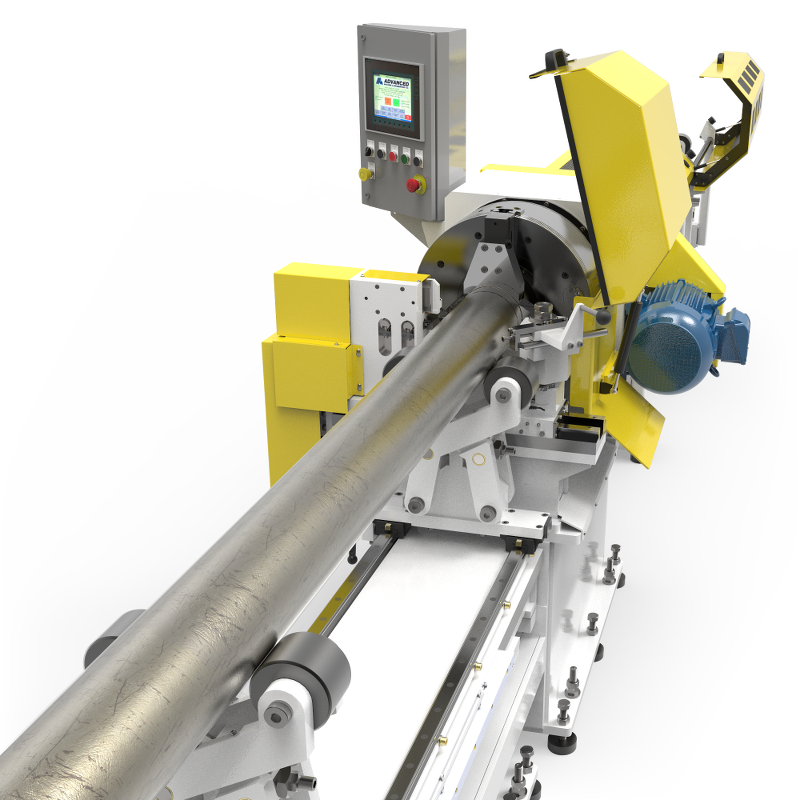 Automated Cut-Off Lathe Improves Operator Safety and Increases Output | Advanced Machine & Engineering Co.
Business growth at a NFPA pneumatic and hydraulic cylinder manufacturer required a second tube cut-off lathe in order to increase output. The company looked to AME to supply a new Automatic Cut-Off Tube Lathe to integrate into their cylinder tube preparation line. That single, integrated tool addition dramatically increased operator safety, and shortened the production time on each cylinder by as much as 10%. TRD Manufacturing, Inc. of Machesney Park, IL, manufactures NFPA pneumatic and hydraulic tie-rod style cylinders that are used in packaging, food processing, mining, and timber. TRD's systems and parts are well known and respected for high-quality construction and durable, long-lasting performance. Founded 35 years ago, they began as a contract machining company, producing precise, close tolerance lathe and millwork. Their expertise in precision machining then led to the development of a select line of high quality NFPA cylinders. Acquired by Bimba in 1998, the company has been able to increase their select cylinder line while maintaining the quality and dependability that customers have grown to expect. TRD Manufacturing produces a great variety of cylinder models and related products, including customized options made to the user's exacting specifications, delivered in 2-3 days. The company offers it's clients not only the best equipment, parts and systems, but has built a strong record of customer service and satisfaction as well. They provide high fulfillment efficiency without sacrificing respected precision and quality. Aluminum tubing that has been hard coat anodized on the inner diameter is a common type of raw material used for a cylinder body. For 15 years, TRD has used a custom built manual lathe that cuts a tube section to a desired length from a long tube. During this process, the tube is faced off on each end for the proper length and required squareness. This process produces a component of exacting quality while providing speedy turnaround time for customers. TRD's business was growing and in need of a second tube cut-off lathe to keep up with the demand. 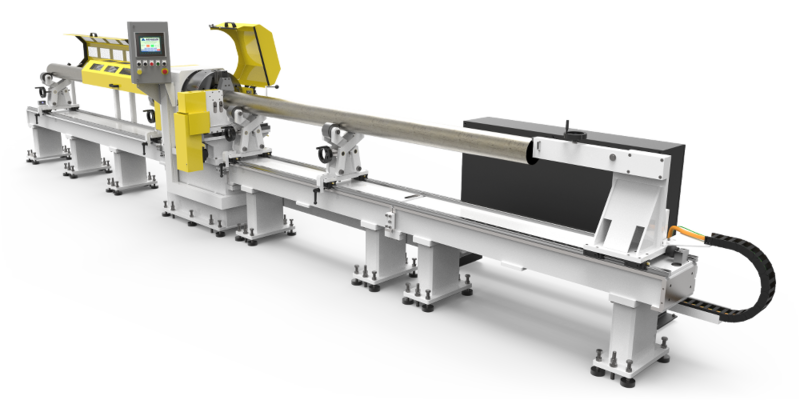 However, the existing manual cut-off lathe requires direct operator handling, which brings a level of risk to the operator. Safe operations procedures on the tooling floor are given a high priority at TRD. After consulting with AME about their options for updating and expanding their lathe cutting and finishing process, Kerry Reinhardt, TRD Manufacturing General Manager, concluded that acquiring an AME custom machine would greatly increase operator safety with better guarding, while increasing efficiency by reducing the operator handling time required for each cylinder tube. By installing the new machine, the process became safer, simpler, and faster. Change-over between tube sizes now moves very quickly, and the repeatable tolerances of the finished items are completely consistent. Mr. Reinhardt turned to AME for a proposal because he had worked with the AME AMLOK® division before, and had become familiar with their Design & Build services. 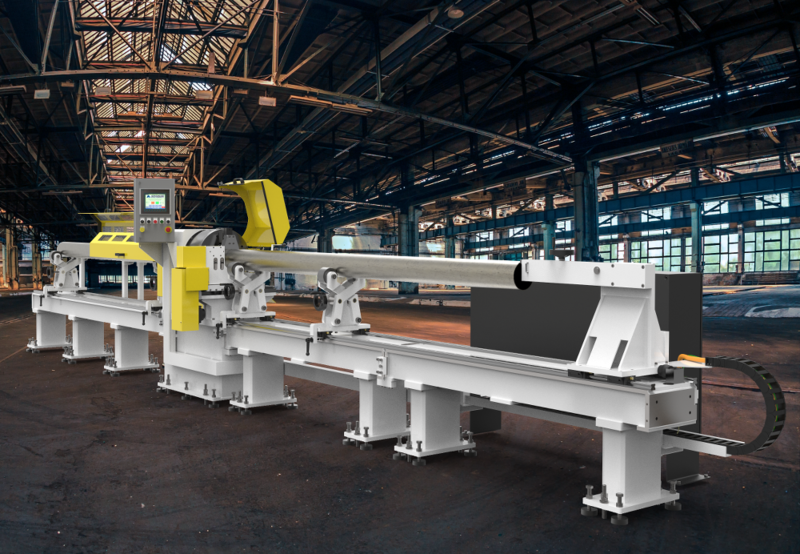 Steve Schubert, Product Manager for AME Design & Build services, and Chris Rindels, AME Mechanical Engineer, proposed this automated solution that combines the cut-off, trimming to final size, and finishing in one machine that minimized operator intervention and increased safety. 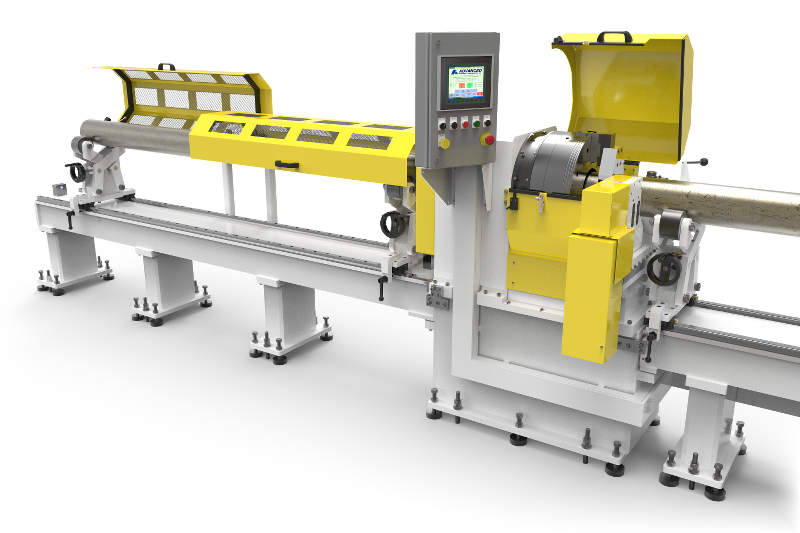 The custom Automatic Cut-Off Tube Lathe created by the AME team accepts 20' long tubes in various OD sizes that can be loaded onto an in-feed loading table. The machine feeds each individual tube through the headstock until it meets a PLC controlled length gage, and with a push of a button on the HMI, the tube is clamped by a pneumatic chuck. The operator then turns on the chuck and pushes the cross-slide feed button to cut the tube to the desired length. After simple de-burring, the part is complete and ready for final assembly. TRD operators explained that the AME custom machine has fast through-put, consistent and repeatable tolerances, a fast change-over between tube sizes, and is easy to use. And the company's priority of realizing greater overall safety and guarding for the operator was achieved. The biggest challenge to AME in developing this machine was the cut-off tube collector. The lathe is equipped with a manually adjustable, pneumatically actuated catch rod that extends out into the I.D. of the part. The catch rod is required on shorter parts less than 2 feet long but is also used on the longer parts for safety. It catches and supports the part after it is cut to prevent the cut piece from dropping into the cut-off tool. After the machine was completely assembled, AME discovered that it was difficult for the operator to know if he had the cut-off tube catch rod positioned properly for the size tube he was working with since the catch rod is hidden inside the tube during the operation. Mr. Rindels and his team added a window with a sight glass so the operator could see if the catch rod was adjusted properly. Mr. Schubert explains: "As with any special machine there are always design challenges. Basically, we're inventing a solution in each of these cases. This is a typical challenge we face when designing anything for the first time." After completion of all testing, the new machine was moved by the AME team to the TRD facility. The machine was designed to be separated into three parts, to simplify transport and installation. At the TRD facility, the AME team did the simple reassembly, conducted the final on-site testing, and then provided training to the TRD operators. The installation went smoothly and quickly, according to TRD. The other great plus for TRD in adding a machine designed by AME, according to Mr. Reinhardt, is the support now in place for this machine. "We did not have any support for the old custom lathe we were supplied with 15 years ago, so to have the support that AME could give now is very important as well." Support is a key feature of AME's Design and Build services. According to Mr. Schubert, "Even after it ships, if a customer comes back to us and shows us a feature that just doesn't work, we make changes to find a better solution". Mr. Reinhardt says he realized about 10% greater productivity from AME's solution, but put the most value on the safety improvements. "We gained in productivity but the safety increased considerably, which is unmeasurable when it comes to the importance of ensuring the safety of our employees." He also pointed out that "This tube lathe is the first major machine we had AME build. We would certainly use them again for any other specialty machinery needs".